I have been a fan of Kato for years, and so when they came out with their SD40-2 with ditch lights I was eager to get my hands on one. Like any Kato, this is a very smooth running locomotive. This locomotive comes with a speaker mount in the fuel tank, and the Digtrax DH165K1A is designed as a drop-in replacement for the factory light board, and includes LEDs for the ditch lights as well as the headlights. Combined with an SFX004 SoundBug, this was one of the easiest sound installs that I’ve ever done. Though technically a two-decoder install, the DH165K1A and SFX004 work together seamlessly. There is very little overlap of CVs between the two, so you can program them as a single unit. 2 (start speed) 2 This controls the minimum voltage applied to the motor at speed step 1. 3 (acceleration) 38 This controls how quickly the locomotive changes speed when accelerating. 5 (top speed) 99 This controls the maximum voltage applied to the motor at full throttle. 6 (mid speed) 49 This controls the voltage applied to the motor at half throttle. 51 (ditch lights) 106 Ditch light configuration for the F1 decoder output. 52 (ditch lights) 107 Ditch light configuration for the F2 decoder output. 58 (volume) 15 This is the overall sound volume. 62 (ditch lights) 4 Ditch light flash rate. 63 (ditch lights) 60 Ditch light holdover time (how long they flash after the F2 key is released). 140 (volume) 64 This is the prime mover sound volume. 141 (volume) 20 This is the bell sound volume. 142 (volume) 64 This is the horn sound volume. Kato locomotives are typically very smooth runners, and this one is no exception. It is a little noisier than my other Katos, however, with a bit of drivetrain growl. It’s still quiet, just not as quiet as I’ve come to expect from Kato. The factory-installed speaker enclosure in the fuel tank makes it easy to add sound, though at the expense of some weight. This locomotive with the decoder and speaker weighs 15.5 oz. One of my older Kato SD40-2s, even without a decoder, speaker, or couplers, weighs 18 oz. I like the fact that since this model represents 1990s-era prototype, that Kato went the extra mile and lowered the Santa Fe headlight and left off the marker lamps. I wish more manufacturers would leave off the cast-on marker lamps on modern equipment. The model comes with free-standing grab irons. The grabs are cast in some kind of plastic and are a little thick to my eye, so I’ll probably eventually replace them with metal ones. Other details are lacking or oversimplified, like the snowplow. Fortunately all of that is fixable. The basic model itself looks right. 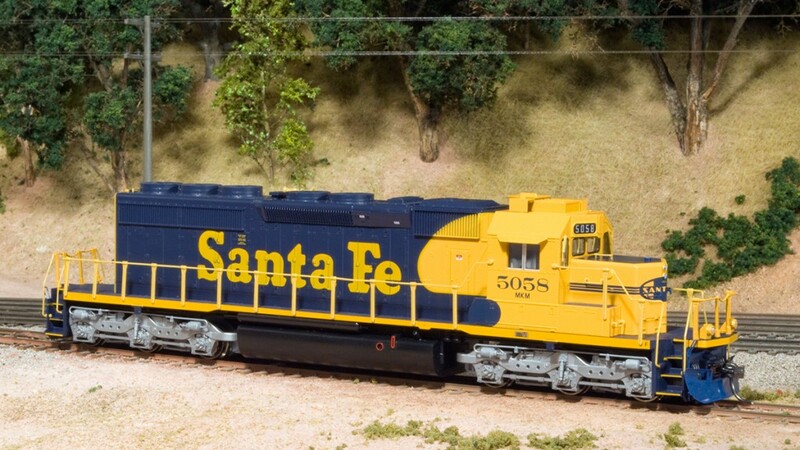 My only other complaint is that the “Santa Fe” on the sides of the long hood is not very well rendered, the yellow is thin and shows the blue behind it. At some point I may try using some Microscale decals to fix this. The DH165K1A runs the locomotive well, giving good smooth overall performance. As often happens with LED ditch lights, the flashing is subtler than on the prototype. It would be nice to see the lights go almost out instead of just dimming slightly. The SoundBug is preloaded with generic diesel sounds (the instructions say it is from a SD38-2). 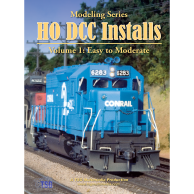 If you’re one of those modelers who wants completely authentic sounds, this might disappoint you, though the decoder can be programmed with new sound sets. The horn has a nice echo effect. I did notice that when the decoder is muted it still makes a bit of static noise, though it’s not really noticeable unless your ear is close to the locomotive.